The following examples show how to implement some basic function with JSP pages. 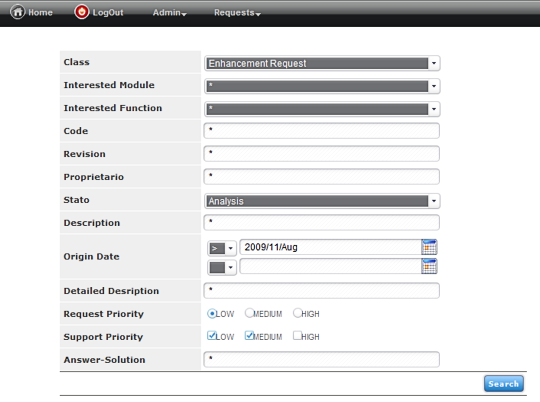 This JSP page performs the login to OBEROn for the username and password passed as input parameters from the login page and generates the application menu with all commands available for the framework user. The html code for the navigation menu is stored into a session attribute and it doesn't change until the user re-logins to the system. Moreover, the menu-command labels are translated to the browser language if their translations are defined into the OBEROn dictionary. this parameter included into the framework informs the generic user interface level that current user is connecting through a web interface; you can implement some filters to enable / disable application functionality according to this fact. This JSP page is an include page (the header page); it shows the navigation menu extracted from the session attribute. The following JSP page can perform both the object creation and the object data update (if the input ID is passed as input parameter). 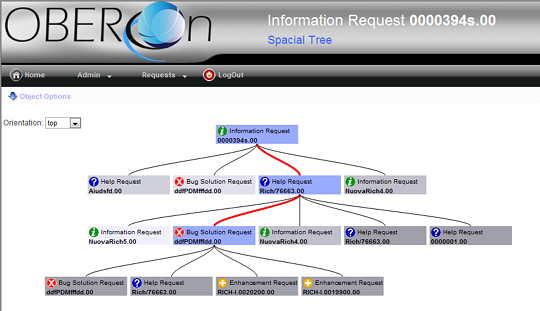 It also manages both the user interface for data input (createHTMLForm) and the database update process (saveFormData). These two methods are defined into the "forms.jsp" include page. The forms.jsp page represents the HTML implementation for the form administrative objects: in other words it generates the HTML code based on the form parameters and on the form-item parameters, included all the AJAX calls needed to load/refresh the field ranges and to validate the field-item values. The search.jsp is similar to the edit.jsp: it manages the user interface for the query input filters (createHTMLSearchForm); this method is also defined into the "forms.jsp" include page. It requires the search form name as input value and shows the HTML code based on this form parameters and on its item parameters. 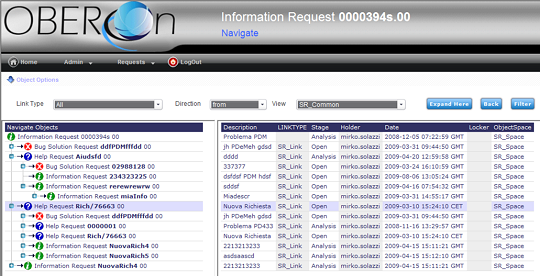 This JSP page executes the search query based on the filters defined into the search.jsp. 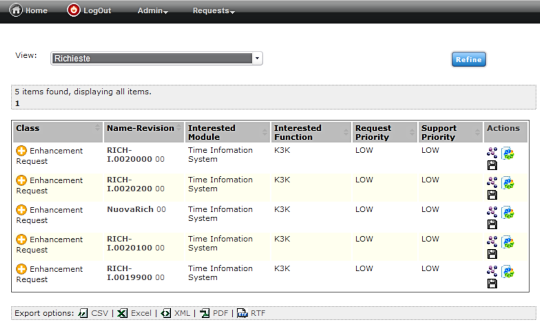 It employs the searchObjects method included into the "forms.jsp" page. In addition, you can apply a view (applyView) to the query results to extract and show several object properties. This JSP page shows how to download from OBEROn the attached files for a specific object instance. It extracts the file properties and displays on a html table their download links. The download process is performed with the JRFileGetServlet. 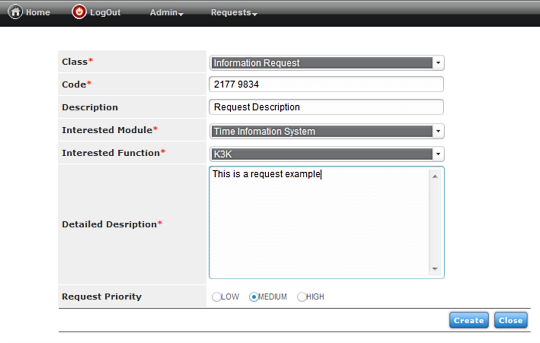 This JSP page shows how to upload a file to OBEROn and attach it to a specific object instance. The file is sent to the JRFilePutServlet togheter with other parameters as a "multipart/form-data" request format. This JSP page loads the object's lifecycle and generate its graphical representation. The user will be able to progress or regress the status and to validate/refuse the path validations. 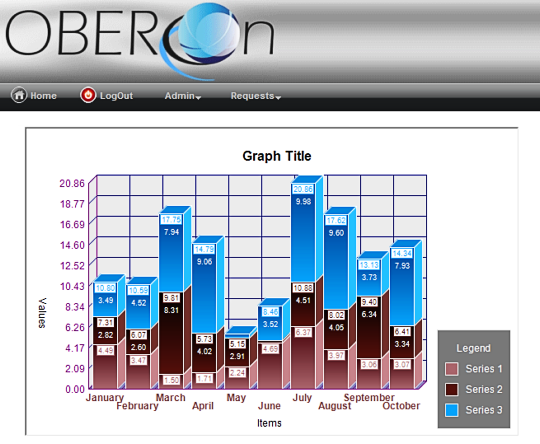 This is a simple example that show how to generate charts using the OBEROn internal chart engine. The JRDrawGraphServlet is invoked passing to it the name of graph administrative object representing the chart style and the xml data representing the plot values. The servlet can also be called by a AJAX request.